There’s no shortage of PR reps banging on the electronic doors around here, offering products to sample. As I’ve mentioned before, however, it’s pretty rare for me to accept the offer (books are a notable exception – which I’ll get to in posts soon to come), mainly because most of these products are types of booze I’m either ambivalent about, or actively seek to avoid. This is an exception (and, in keeping with a promise I made at some point, I’m disclosing this fact to my readers — both of you). A ginger liqueur has always been high on my list of things I’d like to try, and when the offer came to sample Canton, I pulled myself out of my lethargy long enough to click on “reply,” and lickety split, there it was. There’s something else I should disclose: I fully expected to be disappointed by Canton. Given the amount of new crap that’s spewed out by liquor companies every year, the new, quality products are in the distinct minority. Considering that 2007 has already seen the domestic debut of spirits such as St. Germain, Lucid absinthe, the Rothman & Winter Crème de Violette and Batavia Arrack van Oosten, I figured that we were far over our quota for good stuff to hit the shelves in one year. And even though Canton isn’t entirely new — a similar liqueur was made in China until about a decade ago, and was also sold under the Canton brand by the same company as the present-day Canton — it’s a re-formulated revival (so to speak), and that’s close enough for me. But after sampling Canton a few times, I find that my initial expectations were unfounded, and I feel comfortable adding it to this list of notable releases for 2007. Canton is, quite simply, an excellent liqueur. Here’s the skinny from the press kit: Canton is a cognac-based ginger liqueur made in France, and available this fall at “chic night spots, fine restaurants, and wine & spirits retailers in New York and LA on a limited basis.” (And, apparently, my house, which is probably closer to a spirits retailer than a chic night spot, considering my surplus of booze and my sleepy social life.) The liqueur is crafted from an infusion of VSOP and Grand Champagne Cognac with baby ginger; finishing ingredients include “Tahitian vanilla, orange blossom honey, Tunisian ginseng and cane sugar.” It’s sold at a gentle 56 proof, in a fetching bamboo-shaped bottle. The Canton came across somewhat hot on the nose at first, with a slight synthetic note that didn’t seem promising, but wasn’t particularly disagreeable. After resting in the glass for five minutes, though, a clear, crisp fresh-ginger aroma came through, with still a touch of alcohol heat. I compared this to the Giffard, which had a more subtle, fruitier nose, but without an assertive ginger presence. On the palate, Canton’s charms came through. Ginger came roaring out of the glass, with a crisp, vegetal spice followed by a long, lingering ginger heat on the finish. The flavor was nicely balanced and not too sweet, with a rich, intriguing base note (from, I suspect, the vanilla and honey) against which the bright flavor of the ginger stood in clear contrast. The Giffard came across with a bit more sweetness and subtlety in flavor; the ginger is more subdued though still clear and crisp, with an interplay of assorted spices (not, alas, listed on the bottle) rounding out the corners of the liqueur. Like the Canton, the Giffard had a nice, warm finish, though Canton’s was longer-lasting and had a more pronounced ginger element. I was actually quite surprised at how well Canton stood up to the Ginger of the Indies (to put this in perspective, Giffard’s Abricot du Roussilon liqueur changed my whole perspective on what an apricot liqueur could be, so I had a lot of faith in what Giffard could do, and high expectations for the liqueur). But, Canton came out great – crisp and spicy, full and round, with a taste of natural ginger and without a cloying sweetness. I haven’t really started mixing with it yet, but I know there’s a lot of opportunity here. If you happen to come across a bottle and try a new cocktail, be sure to give me a heads-up, and I’ll do the same. 13 Responses to Ginger, Hail! I’ve got a bottle heading my way as well, and I’ll post on it when I have a good opportunity. As for mixing, the cognac base immediately suggests a gingered sidecar, but I’m sure some good thought will suggest more creative options. Sounds interesting, surely. The first thing that sparks in my mind is to create a drink with it that mirrors the flavors in Falernum. Adding to the ginger collection, there’s also Yazi ginger vodka. It’s ok, you beat me to the punch regarding Kubler, so I’m holding on to my post for a bit as well. Let the blogging wars begin! Well, technically it is the first Ginger liqueur as it’s been produced since 1990. Though it should be “re-launches” as they’ve changed the formula and stopped and started production a few times since then. 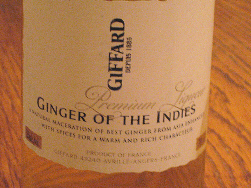 Though Giffard is very old, they’ve only been producing the Ginger product for a short time. The thing I don’t understand is why no one check’s on anything before saying they’re the first. I recently received a bottle of the “First American Vodka,” even though there are 10 or so that are produced exclusively in the U.S.
Got my bottle a lot sooner than I expected. The marketing rep actually couriered it to me instead of shipping it, since we’re both in Manhattan. Having tried it, I now know that because it is indeed a liqueur, it was kinda stupid for me to say it could swap in for cognac in a sidecar. That would be one sweet sidecar. I’ll reserve the rest of my comments for my own blog post, except to say I really liked the Canton. This is the good stuff. Interesting. I have a couple bottles of the old Chinese manufactured Canton. Wonder how different it is? Obviously, I need to write more frequently about cocktails, so I get in on the free stuff action! After reading this, I feel like a kid who had to sit around the lunch table at school while all the cook kids talked about a concert that I was not able to go to. Looks like I’ll have to take a trip to Vessel and try this bottle out. Let the blog wars start, and keep up the good work, Gents. Paul Pacult gave it a 5 star review! 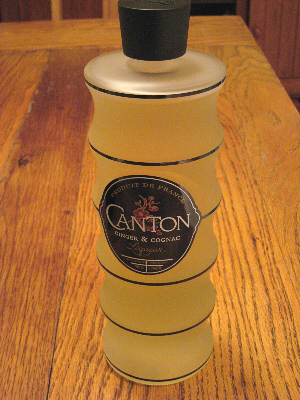 I was pleasantly surprised when I took my first sip of canton, its smooth and spicy, a great mixer! It’s been a hit among my friends as well. I gotta say I was all excited when I heard this was coming out and I rushed to go get me some having fallen in love with “the Original Canton Delicate Ginger Liqueur”. Unfortunately I like the old won better. Maybe it’s because I’m not a huge drinker but the old one was easier to drink straight, more ginger flavor, less booze flavor.